Small Health Investments, Big Reaps! • Investment #1Health insurance: It wouldn't be wrong if I say health insurances are mandatory in each one of our lives. 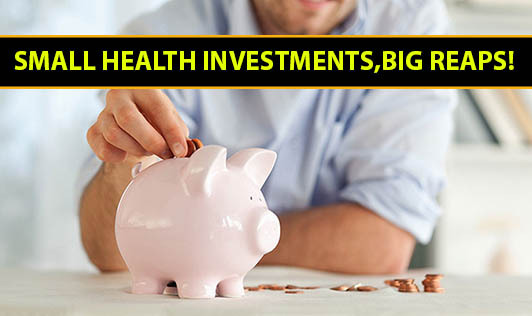 Health can be highly unpredictable and can lead to huge cash flows. At such circumstances, health cover can come as a life saver. • Investment #2 Health Checkups: Regular health checkups have several benefits. It will uncover any hidden diseases from growing. This in turn reduces the risk to your life and cuts down your expenses on medical bills. • Investment #3 Fruits and Healthy diet: Though food commodities have experienced a surge in prices, make sure you do not compromise on food. Investing on fruits and healthy foods is a basic necessity to sustain healthy life. So, think before you spend on junk food. Is it worth it? Instead, buy a kilo of fresh fruits! • Investment #5 Good Oils and fats: Healthy oil and fat consumption is the very foundation of a health life. Invest on healthy oils and fats like ghee, cheese, olive oil, canola etc. Avoid heavily processed or refined oils. Controlled good oil and fat consumption leads to good health. • Investment #6 Good Oral Equipment: Renew your tooth brush, tongue cleaners and other oral equipment regularly. Invest in good quality tooth brush and oral equipment as recommended by your dentist. • Investment #7 UV Sunglasses: Eyes are very sensitive and are prone to damage from harsh sunlight. Invest on a pair of good UV sunglasses for outdoors. They not only protect your eyes but also accentuate your looks. • Investment #8 Good Skin Care Products: Don't go with the products that look appealing in ads. The chemicals used in cheap skin products can ruin your skin's pH balance. Always invest on products that suit your skin even if they are a little expensive. • Investment #9 Basic Home work-out Equipment: We all know that exercising boosts our quality of life. If your busy schedule doesn't allow you to hit a gym or join a swimming class, exercise at home. Invest on some simple equipment like dumbbells, resistance bands, a skipping rope or a stationery cycle. • Investment#10.Good Mattress: A relaxed good night's sleep is very essential for a good health. Avoid mattresses that can lead to back pain or constant awakening. Invest on a comfortable mattress to experience pain free and relaxed sleep.